My aunt was a wonderful artist. I most decidedly am not, but I’m enough of a hobby painter to have been struck by an advertisement I came across in the Sydney Gazette for 11 September 1808, as I was trawling through its pages looking for clues as to what happened during the aftermath of the Rum Rebellion (203rd anniversary last Wednesday). Not a particularly significant ad, you might think – unless you are a painter. But for anyone who has mixed colours on an artist’s palette, those words, in that place and at that time, point to a real tragedy. Carmine is a red pigment. Before the development of the cadmium pigments later in the 19th century, there were three basic sources of red: animal, vegetable or mineral. Vermillion was based on cinnabar, a mercury compound. You see it used in the religious art of the Renaissance. It is poisonous, and also very expensive – not a problem for a religious patron, for whom the price (and perhaps the danger) added to his objective of glorifying God in the most extravagant way possible, but not ideal for a travelling watercolourist. The vegetable alternative was madder, made from a root vegetable. Known as Turkey Red, it was used by the Ottomans in carpet making, but the secret of its manufacture only reached Europe during the 1780s, so it was still comparatively rare. Rose madder is a lovely colour, but a fugitive pigment, liable to fade. The final and preferred option was carmine, or crimson, lake (originally lac, from lacquer), which was made from boiling insects, most successfully the cochineal beetle from the New World, which feeds on cactus. Carmine was a basic tool in the painter’s kit at the turn of the 19th century – so what did you do if, the advertisement seems to suggest, you were about to run out? Lewin worked hard at his art, as far as we can tell, supplying the visual record that scientists and administrators back in England needed to make sense of their new colonial possession. In 1808 he published Birds of New Holland in London. But he seems to have been a hopeless businessman and he was desperately isolated from his artistic peers. He was also isolated from any possibility of replacing his equipment when supplies ran out. The nearest market where European pigments were available was probably Calcutta (Kolkata). There was an outside chance of ordering them from Batavia (Jakarta) or Manila, but neither port traded directly with Sydney. It has been estimated that it took up to 2 years to send a letter to London and get a reply. All the colours in a painting are mixed from just 3 primary colours – red, blue, and yellow. Ideally artists use a minimum of 2 each of the primary colours, one warm, one cool, but at a pinch you can manage with just 3. But without a red, you are virtually at a standstill. 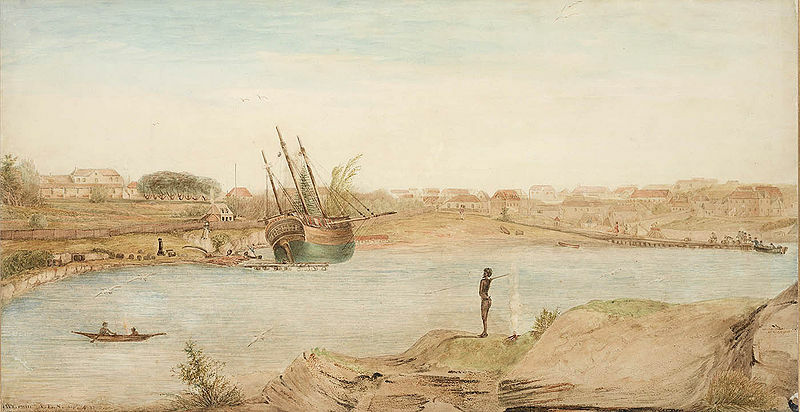 An 1808 painting by Lewin shows Sydney with a few patches of red on the roofs, but he must already have been husbanding his supplies. Ironically, the red coats of the soldiers he saw all around him were dyed with cochineal, but none appear in this painting. According to my aunt, who knew these things, the greens of Australian foliage have a lot of red in them too. But for Lewin, isolated in a settlement of a few thousand convicts and red coats at the end of the world without access to one of the essential primary colours, that red might as well have been a million miles away.